Al Lipphardt, former state commander of the VFW Department of Georgia, (center) presented a $10,000 donation Feb. 3 to Dr. Billy Wells, senior vice president for leadership and global engagement at the University of North Georgia and chairman of the GWWICC (second from left). Also pictured are (left to right) Keith Antonia, associate vice president for military programs at UNG; Army Col. Gery Cummings, professor of military science; and Army Maj. Steven Devitt, military science instructor. The Veterans of Foreign Wars (VFW) Department of Georgia stepped forward in a significant way with a $10,000 contribution to support the efforts of the Georgia World War I Centennial Commission (GWWICC), making the first such donation to the effort. 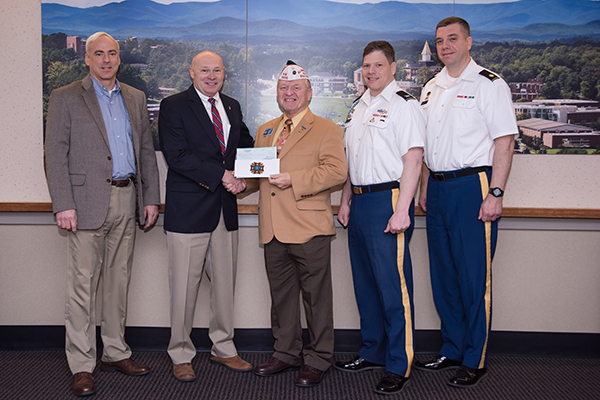 The donation was presented Feb. 3 on behalf of VFW Department of Georgia State Commander William Sandberg by former commander Al Lipphardt to retired Army Col. Billy Wells, chairman of the GWWICC. Wells is also senior vice president for leadership and global engagement at the University of North Georgia. "When the Veterans of Wars of the United States was formed in 1899, the purpose was simple: To take care of those who were deployed to the land of our enemy and to advocate our government on behalf of veterans and those continuing to serve in uniform. Our Congressional Charter, in part, reads the purpose of this corporation is fraternal, patriotic, historical, charitable and educational and 'to perpetuate the memory and history of our dead,'" Lipphardt said. "How fitting for the VFW Department of Georgia to make this initial donation to Georgia's WWI commission in their efforts to commemorate the 100th anniversary of WWI." Lipphardt understands the importance of remembering the service and sacrifices of Georgians who served in “the Great War” a century ago. He served in Vietnam, and his numerous recognitions including a Bronze Star for Valor and a Purple Heart. He has served as vice chairman of the national VFW’s legislative committee, lobbying in Congress on behalf of veterans and their families. "On behalf of the members of the Veterans of Foreign Wars Department of Georgia and its Auxiliary, we challenge the other veteran service organizations in Georgia to join us in celebrating our World War I generation," Lipphardt said. The GWWICC was created by act of the Georgia General Assembly and signed into existence by Gov. Nathan Deal in May 2015. Its six volunteer members are charged with developing a program that educates Georgians about the significance of WWI in history and the role Georgians played in it, honoring Georgians who served and sacrificed, and commemorating the people, places and events in Georgia that contributed to the liberation of Europe. “Because of the benevolence and generosity of individuals and organizations like the VFW, we’re able to undertake many activities that honor the service of Georgians who fought in the Great War, educate today’s citizens of Georgia about the war, and commemorate Georgia’s participation,” Wells said. The University of North Georgia is one of only six senior military colleges in the nation and is designated as The Military College of Georgia. As such, UNG has taken a leading role in supporting the work of the GWWICC. The Commission receives no state funding and operates entirely on private donations from individuals, corporations and foundations. Among the projects it supports are developing curriculum for the state’s public schools regarding Georgia in World War I, an essay contest for Georgia high school students in cooperation with the Georgia Humanities Council, identification of all existing World War I memorials in Georgia, and encouragement of programs and ceremonies to observe the centennial in communities across the state. The United States entered World War I with a declaration of war on April 6, 1917. By the time of the Armistice on Nov. 11, 1918, there had been 375,000 American casualties, including 116,516 deaths – more than Korea and Vietnam combined. Georgia was home to more training camps than any other state and some 100,000 Georgians served in the effort. For more information on the work of the Georgia World War I Centennial Commission, see www.ww1cc.org/ga.